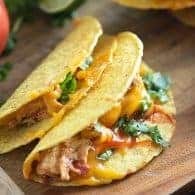 Crock Pot Chicken Tacos - my favorite way to make tacos! Crock pot chicken tacos just might be my favorite thing to serve on taco night! We all love the juicy, flavorful chicken and this recipe is so easy to make in your slow cooker! My BFF and I went on a cruise together last year and it was the first time we’d really had multiple days together since high school. I mean, we both have families that demand our time so it’s not like we have a lot of sleepovers these days. Well, on the cruise, she happened to notice something about me that she hadn’t noticed before. My ability and desire to turn any and every food into a taco. I’m a taco nut. I love them and could eat tacos every day and never tire of it. My fried tacos and taco lasagna are total staples in this house. I also regularly make scrambled egg tacos for dinner, because it’s so dang easy and I always have the ingredients on hand. These crockpot chicken tacos are so good! Anyway, I like to mix things up and get creative in the taco department and one of my favorites is crockpot chicken tacos. The meat is so tender and juicy. It’s bursting with flavor, because I go a little above and beyond your standard packet of taco seasoning here. I add in some ranch powder. And some fire roasted diced tomatoes. I loooooooove this shredded chicken taco meat! I used crispy taco shells in this recipe and stood them up in a 9×13, filled them with the meat, topped with cheese, and then baked everything to cheesy perfection. I love how easy it makes for everyone to grab a taco this way and the warm shells and gooey cheese are amazing here! But, you can totally use soft tortillas or skip the baking party if you prefer. 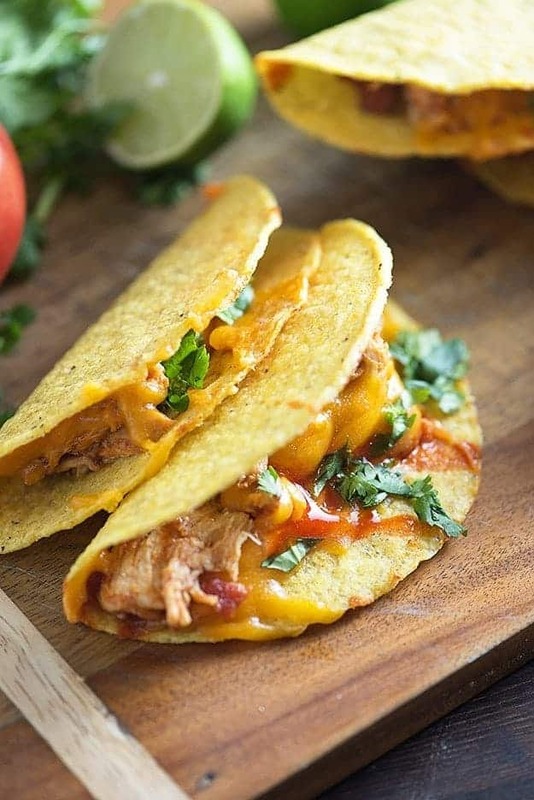 Slow cooker chicken tacos are the answer to taco night! I also give these a big ol’ drizzle of Cholula, but you can use any Mexican hot sauce or taco sauce you prefer. Salsa would be great too! 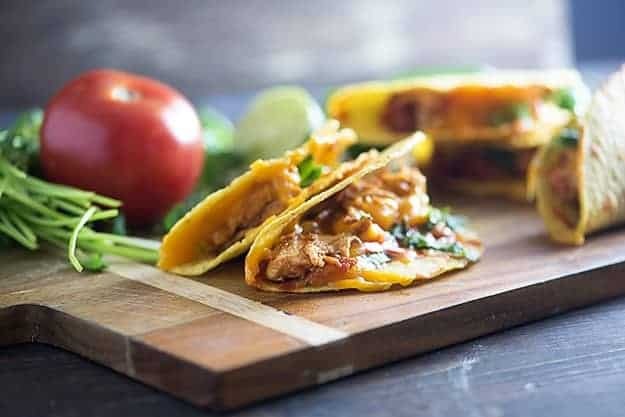 The chicken in this recipe is perfect in these tacos, but it also works well in lots of other ways! I made some sheet pan chicken nachos using this recipe, but the chicken would also be great in my burrito casserole! Try it in my taco lasagna too! I hope you guys go as nuts for these tacos as we do! I’ll be back soon with a nacho recipe featuring this meat that you’re going to love as well! Crockpot chicken tacos - simply seasoned and oh so good! Place chicken, taco seasoning, ranch powder, and tomatoes into a slow cooker. Cover and cook on high for 3-4 hours or low for 5-8 hours or until meat is easily shred with a fork. Preheat oven to 350 degrees. Arrange taco shells in a 9x13 baking dish. Depending on the shells, you may need to use two pans. 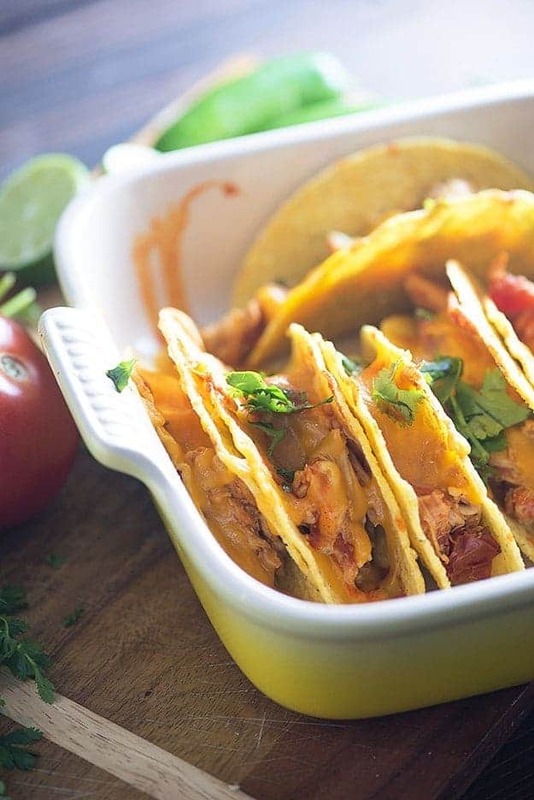 Spoon meat into taco shells and top with cheese. Remove from oven and sprinkle with diced cilantro and drizzle with hot sauce or taco sauce. 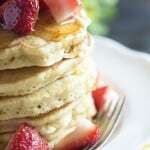 Sounds delicious and so easy to make, will have to give this recipe a try soon! These look delicious and will try your recipe soon. Yum!!! Taco Tuesday, I’m ready for ya!!! This looks incredible, and I love that all the hot cooking is done in the slow cooker – especially when it’s been in the 90s constantly! Plus – it’s gluten free. WOOHOO! Great video, this is definitely going on the rotation this week. YUM. Yes!! Anything can be a taco, haha. It’s so fun. And that cruise sounds so relaxing. Makes me wanna go on a fun vacation with my friends. I’m a huge fan of crockpot chicken tacos! Can’t wait to give this one a try next. So perfect!!! I can’t wait to try these! 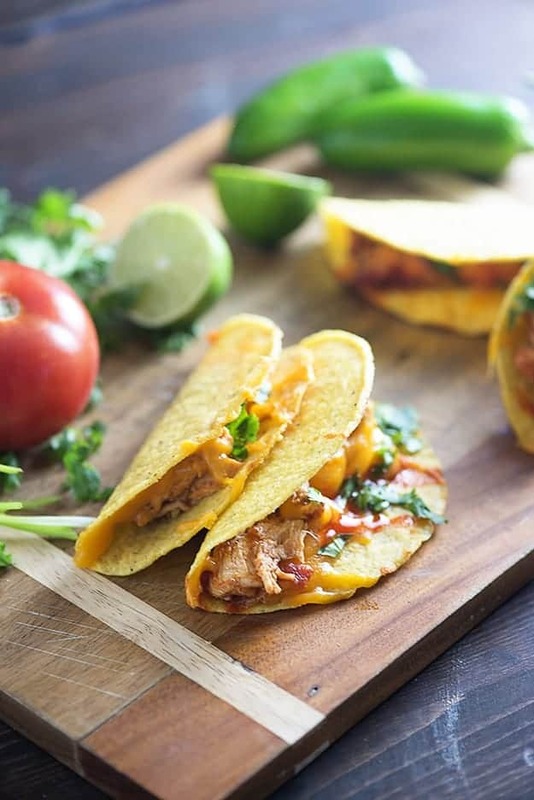 My kids love tacos, and I love anything that I can toss into my slow cooker. Your photos are lovely, too! I want to nibble on this after looking at those amazing photos, so drool worthy! Wow these look INSANE! I know what I’m going to try for next taco tuesday! this was a hit in my house!! instead of regular taco shells, I used the doritos kind.. mmm it was so good. even my picky 4 year old loved them! Super easy and super tasty! We loved these! Just got done making these. Yum! My house smells so good, this was super easy, and completely delicious! Thanks for sharing this recipe! 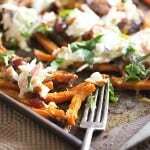 hi, I love the idea of this recipe, but my family dislikes ranch… any substitutes? You can leave it out entirely. Yum! taco night is a favorite in our house. and chicken tacos is probably our all time favorite. i always add guacamole or at least diced avacados and that paired with the cilantro makes it just heavenly. of course my husband is the hot pepper and salsa junkie so those are always good options to keep in the back pocket. and i’ll bet the ranch powder gives this such a distinct and different flavor. i cant believe i never thought of that. I don’t calculate nutrition information, but you’re welcome to add this to one of the many online calculators. Omg! Just made these and they are delish. I didnt know it called for Fire roasted tomatoes. I used diced tomatoes and added a can of diced jalepenos instead. I also added sour cream, cheese, avocado, salsa & ate on mini soft shell tortillas. My husband said, “This is exceptional! It’s an organism in my mouth.. I love it!” Lol needless to say this will be added to my rotation of dinners to make! thanks again! I bet the addition of jalapenos was perfect! Glad you two enjoyed these! We don’t have time for the crockpot before supper. 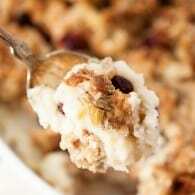 Have you ever done the chicken mixture in the oven? If so, how long and what temp? I would do this on the stove top, poaching the chicken for 20-30 minutes and then draining and mixing in the seasoning and tomatoes. Can you leave the baking at the end off if your not using hard shell tacos? how would I cook this in an Instant Pot? Just add broth? Hi! I LOVED the bourbon chicken!! So I’m back, and trying these chicken tacos tonight. Why such a range? 5-8 hours on low. What amount of time do you recommend for a slow cooker? The bourbon chicken shredded easily after cooking for 4 hours on low. Let me know! I’m new to this slow cooker business and I’m loving it! Hi Denise! So glad you enjoyed the bourbon chicken! I usually give a range because all slow cookers on different. It’s also pretty tough to overcook meat in the slow cooker, so people like to start it before work and leave it all day. 🙂 Once it shreds, it’s ready to eat so take it out anytime you’re ready. I hope you love these! These tacos are a favorite of mine! Hello! Cooking this right now in my crockpot!My kitchen smells amazing! I used my own taco seasoning,can’t wait for dinner!Thank you for this recipe!.. We LOVED this recipe! I used diced tomatoes with green chilis instead of the fire roasted. We used two large chicken breasts and we have plenty for leftovers. The flavor is wonderful! Can you bake them with soft corn tortillas? Has anyone done it? Would I have to fry the tortillas first? Or can I just stuff and bake? I haven’t tried baking these with a soft corn tortilla. I would fry them first if you want them crunchy. 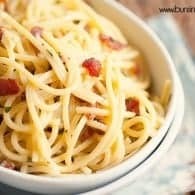 I’ve made this just for hubby & I and we love it so much wr barely have any leftovers! I want to make it for a group. Would you double the recipe? If so, would you leave in crockpot for same amount of time? What size of tomato sauce would I substitute instead of diced? I’ve only made this with diced tomatoes, so I can’t really say for sure. I’d probably add 8 ounces maybe? 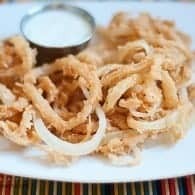 How long would you could these in the Instant Pot? I’d do 15 minutes, NPR, but be sure to add a cup of broth.